Floating Markets are usually on the itinerary for most Bangkok trips. However, the definition of floating markets can be very subjective e.g. always check that the floating markets mentioned in your itinerary is not really just a boat cruise along Chao Phraya river where one or two boats will peddle towards you selling you overpriced fruits and vegetables. The real deal floating markets lie outside Bangkok e.g. the very famous and touristy Damnoen Saduk floating market (2.5-hours away) which starts early in the morning – which means you have to leave Bangkok at around 5-6am. While Damnoen Saduk is flooded with tourists every morning, it is as good as you get for a feel for a Thailand floating market. 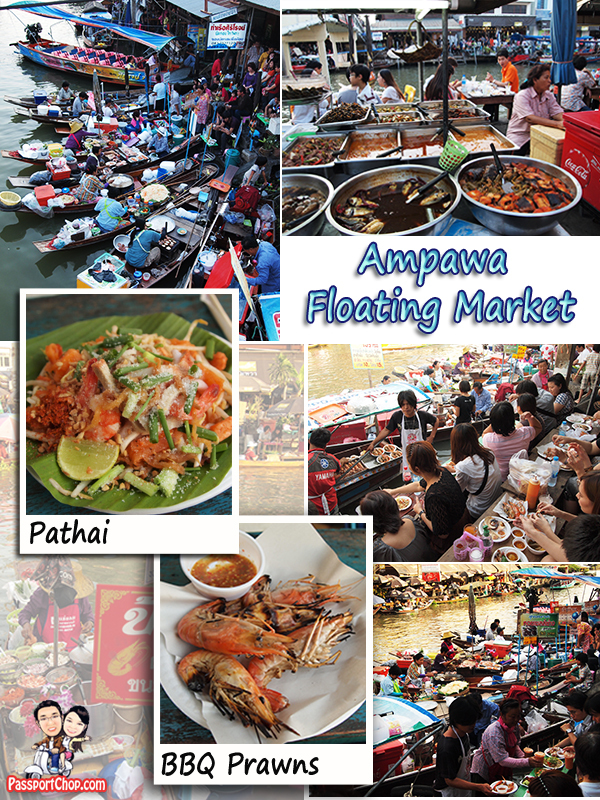 Unlike Damnoen Saduk, there aren’t boat cruises through Amphawa Floating Market – the part of the market that is floating is just the 6-7 boats selling cooked food and they are permanently stationed by the bridge (at least during the opening hours of the market). The rest of the market are makeshift pasar-malam style stalls or permanent shops by the river. This is where you get your “I Heart Amphawa” T-shirts and other Thai snacks. The market goes way beyond the river – the area around the bridge is where it is most crowded with activities but the makeshift stalls also extends into the Amphawa town – you can find just about anything here e.g. T-shirts, magnets, clothes, shoes and accessories – prices are slightly cheaper than those in Bangkok downtown but you will have to bargain a bit to get the best price. Amphawa Floating Market also serves as a base for boat operators to run evening fireflies cruises. The price for such cruises typically cost 60 Baht per person and depart from Amphawa at around 7pm and arrives back at the pier at 8pm. There are minivans that make the 1-hour journey from Bangkok Victory Monument to Mae Klong Railway Market where you will need to transfer to another mini-van which brings you to the area around Amphawa Floating Market in 10 minutes. This ticket will cost about 80 Baht (about SGD $4). You can time your trip so that you can check out the Mae Klong Railway Market with the train coming in at the right time before proceeding to the Amphawa Floating Market. I am unable to advise on the above mini-van journey as we took the private tour services e.g. Rat Service – http://www.ratservice.com. For a half day private tour of Samut Songkram area which includes the Maeklong Railway Market, Amphawa Floating Market and 2 other beautiful temples, we paid about 2000 Baht for a driver/guide (hourly rate – about 250 Baht/hour), gasoline for the car (Toyota Corolla 1.6) and expressway tolls. The fee is charged at a per car rate so you could share the costs with 3 other friends, making it an affordable and convenient way to tour the area comfortably. Our tour was organised by Vimonrat (can call her Rat) and she is contactable at [email protected] (Tell her that PassportChop.com referred you). For cheap flights to Thailand, book early and look out for promotions from budget airlines e.g. Tiger Airways and Jetstar Asia. The BBQ Prawns look so good! We’ve put Singapore on our “must visit” or “travel bucket list” some time ago! 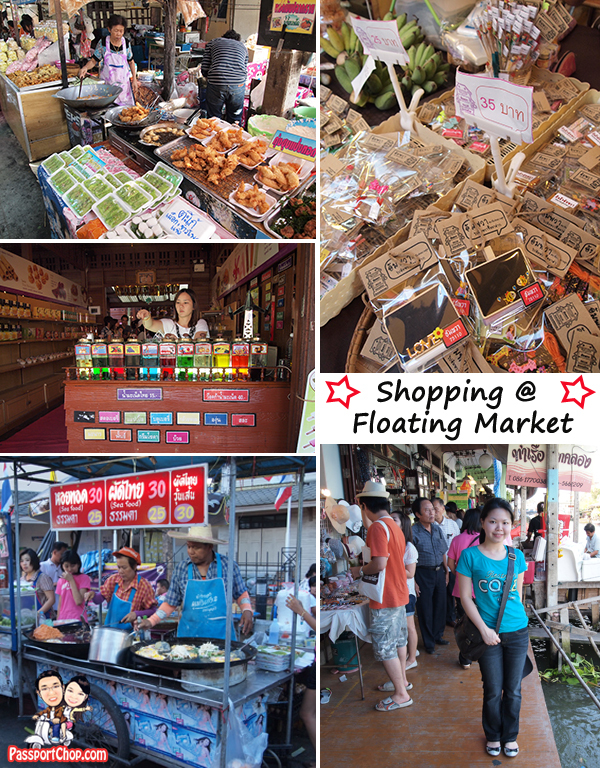 Thank you for the post regarding the floating markets in Thailand. I visited once a popular floating market alongside a canal in Bangkok, and it was awesome. I found everytihng I needed: from fresh fruits, veggies to luscious sea fooods. I did have a great time. My family and I plan to visit the country again soon. Hi Your blog is great. I would like to take rat’s tour with 2 friends. Does she goes I danoen Saduk floating market? Yes. I believe she does arrange tours to the Damoen Saduk floating market. Thanks for your blog regarding fireflies. Always wanted to such boat trip for fireflies but missed them when in Johor.You blog is great for another of our Bangkok trip. My understanding is that Rat charges on a per car basis (not per person basis) for her tours. Personally I feel that 3000 baht (about 130 SGD) for a half day private tour is quite reasonable for the convenience and privacy and comparable to the prices for those big bus tours. If you have a group of 4 travellers, the cost can be split even more (down to just 30+ SGD per person). For the 2000 baht I paid for the tour to Amphawa Evening Market and Train Market with Rat, it was taken in Feb 2011 and excluded the trip to see the fireflies (as we have seen them in Johor). Adjusting for inflation, rising gasoline costs, the extra hours needed to take the fireflies tour (since Rat charges by the hour) and the boat trip to see the fireflies, this could explain the additional 1000 baht difference. Let me do some rough calculations here (note that the prices mentioned below are based on Feb 2011 rates – prices might have increased since then due to inflation): The fireflies boat tour will take about an hour plus (let’s round it up to 2 hours) – 250 baht per hour = 500 baht; the boat trip had cost 60 baht per person. Thus this could potentially have added up to another 620 baht (assuming 2 persons and not adjusted for inflation and gasoline price not taken into account). If its my first floating mkt trip. .. from a foodie and photography perspective. .. would u recommend the morning or afternoon (ampawa) one? We can only choose one. Thanks!!! The amphawa floating market is only open in the evening so an afternoon tour will be best. The photos will turn out great as you can hire a boat to take you along the market – the food is great too!